Motherwell are a club in search of stability. 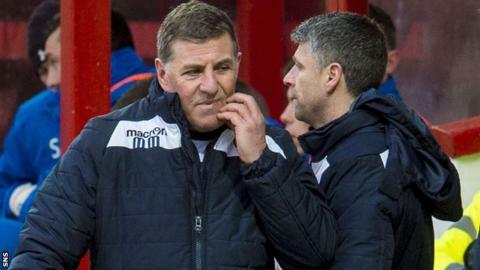 Mark McGhee is the team's third manager in 15 months and, while form continues to fluctuate alarmingly, the mood around Fir Park is restless. The supporters have had to adapt to a sense of anxiety and they jeered the team at half-time and full-time at the weekend. Since Stuart McCall led Motherwell into Europe and two successive second-place finishes in the top-flight, the threat of relegation has imposed itself. There was an escape in the play-offs last season, when Rangers were overcome at Ibrox and Fir Park, but McGhee has already acknowledged that finishing second bottom this season is less of a respite, since the top three in the Championship - Rangers, Hibernian and Falkirk - have all consistently impressed. McGhee is in a combative state of mind. He described the performance of his players in the 2-0 defeat by Kilmarnock on Saturday as "diabolical", but there has never been a sense of him underestimating the challenge after succeeding Ian Baraclough in October. His first game in charge was a 1-0 loss to Celtic at Fir Park, a result that left the team in 10th place, one point clear of the play-off position. Since then, Motherwell's form and fortunes have mirrored those of most of the teams outwith Dundee United - who continue to be adrift at the bottom - and the top three. A run of five league games without defeat (three wins and two draws) enabled Motherwell to climb to eighth place on 2 January, only three points off the top six and four clear of the play-off position. They have lost all but one of their five league games since then, though, and are now back in 11th position, having been overtaken by Kilmarnock at the weekend. McGhee has said often enough that there is little between the teams that are bunched behind Celtic, Aberdeen and Hearts - and to an extent that's true; inconsistency has tended to confound them all. Gary Locke stated that, as one of the reasons that he stood down as Kilmarnock manager, his team was capable of earning a merited 0-0 draw at Celtic Park then lose 5-2 at home to Partick Thistle in their following game. When McGhee took charge of Motherwell, Hamilton were fifth in the Premiership; they spent most of January in 10th place, before rising back to eighth in the current table. Even so, Motherwell's fragility runs deep. John Boyle's time as majority shareholder had run its course and Les Hutchison's purchase of that stake 14 months ago ensured a fresh impetus. The fundamentals of the club remain the same, though: Motherwell run at a loss, the playing squad is imbalanced and there has tended to be short-term thinking. Hutchison has attempted to address the issues, making appointments to try to raise the commercial revenue streams, modernise the football department and bringing in McGhee once confidence was lost in Baraclough. A strategy is in place to improve the development of players - McGhee has met the youth coaches to outline the plan that Hutchison has agreed to - and 10 players departed during the January window. For now, though, Motherwell need to revive their form. A run of late goals was concerning enough, but the display in the 2-0 defeat by Kilmarnock will have troubled McGhee more. He spoke afterwards of the performance being the poorest of his second spell in charge. The trip to Tannadice on Tuesday is crucial, then, to Motherwell's self-esteem but also the nature of the relegation battle. They have pulled clear before and have the ability, in players like Stephen Pearson, Scott McDonald, Louis Moult and the (albeit inconsistent) Marvin Johnson, to score goals, but individual errors in defensive situations have proved costly. McGhee has the wherewithal to steer his team out of trouble, but that alone is not a guarantee of safety since essentially the same group of players find themselves, just now, in the same position as last season. In striking his 30th goal of the season for Celtic, in the 2-0 win over Ross County, Leigh Griffiths confirmed again that he has become a talisman for the side. The team's display was not as convincing as it might have been, but the result was decisive enough and that will renew the self-belief of the team. The presence of Griffiths in the side is also reassuring for Celtic, though. His goals have adorned this season, but they have also been vital at times. A trawl through his league stats show that removing his goals would cost Celtic seven points and leave them trailing Aberdeen in second place. The analysis is crude - if Griffiths wasn't in the side, there is no way to measure how his replacement would fare - but it is an illustration nonetheless of his importance. Without his goals, one draw would have turned to a defeat and three wins would have become draws. Griffiths, in his growing maturity and unshakable conviction in front of goal, increasingly represents the best of Celtic's ambitions this season.